Please email me for comments, corrections, or suggestions. Take A Zhance is my regular column in The Iron Warrior, the magazine of the Waterloo Engineering Society. The focus of these articles is to examine engineering from the point of view of the student. The purpose of these articles are to raise issues on relevant issues. My ideas are meant to provoke critical thinking. I do not expect you to agree with everything I have to say. Please email me if you have any comments about my articles. The first installment was published in September of 1997. I have had an article in every issue of the Engineering Society 'B' version of The Iron Warrior since then. I also wrote for one term of the 'A' soc version during my Fall of 1998 while I was on work term in Waterloo. Special thanks to Aaron Leiba for designing my logo. What You Know, Part I - A summary of four years in university. What You Know, Part II - "You don't know that you don't know"
What You Know, Part III - "You know that you don't know"
What You Know, Part IV - "You don't know that you know" & "You know that you know"
Your Last Zhance - My final Take A Zhance article, EVER! Recess Time - Whatever happened to recess time in university? How Many Habits?!? - A comment on "Seven Habits of Highly Effective People"
Take-Off - How a plane flight through the rain changed my perspective. What a LIfE - Are you living a lie? That's Relativity - Relativity made simple. Death By Beer - Is it more important to have a good time in university or to learn? The End of Humanity - Has technology gone too far? Are we just researching our own destruction? The Great Pursuit - What makes humans so much different than other species on earth? Save the Plankton - Do you know more than one side to issues that you have opinions about? The Right One Baby! - Like arts, engineering may not always have the 'right' answer. The Power of None - Does non-action has as much impact as action? The Zhan in the Mirror - Is Canada really the cultural mosaic it makes itself out to be? Power Hour - One hour a week is a small price to pay for your sanity. If It Falls Apart... - Things will work out. Trust me! 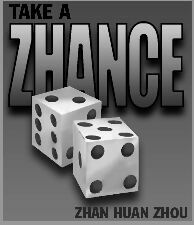 Off Topic - A discussion of my writings for Take A Zhance. Eerie Waterloo - Have you ever been in a place that was almost home, yet felt like you didn't belong? Topical Disaster - The hideous wording of the STV contest topic. The Keyboard Specialist - Are you spending too much time on the Internet? Alphabet Soup - Excellent English skills lead to better Engineering skills. Perfect Imperfection - Mistakes can be a good thing. A Cooperative Mess - All about the perils of the Co-operative Education Administration at Waterloo. Who Are We? - Does the world only need engineers? What a ridiculous thought. The Impossible Article - How did you get to where you are now? Engineering is Good, Part I - A look into the benefits of engineering to society. Engineering is Good, Part II - A look into the benefits of enginnering for students. Why Did Van Gogh Cut Off His Ear? - Because he couldn't stand all the engineering courses! What Rhymes With Engineer - Might be useful when making a poem or doing something else creative. A Group Thing - Engineers work in a team, not by themselves. The Road To Nowhere - Why am I in university? Life, the Universe, and Engineering - Answers to everything.